Rapid inflation, meager growth and a debt default have plagued Argentina for years. But its new president, Mauricio Macri, has surprised many with the blinding pace of change he has undertaken in Argentina -- a country unaccustomed to economic reform. 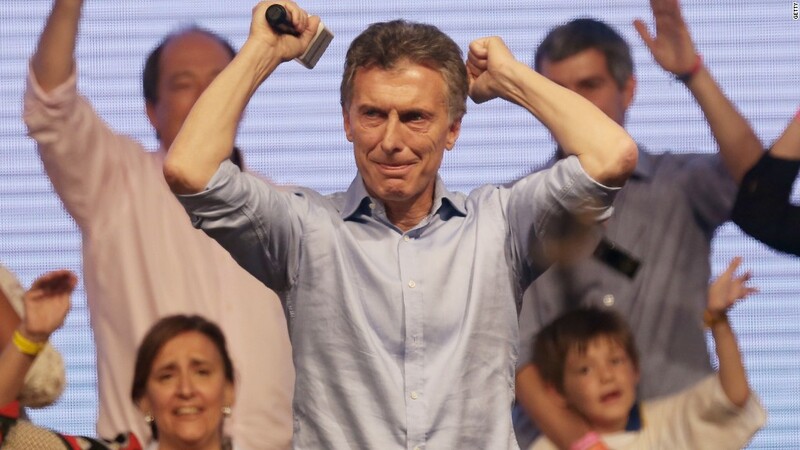 Macri promised to reboot Argentina's economy, if elected. And since he took office on December 10, he's following through. The biggest change came Thursday when the administration lifted currency controls and let the peso float freely. "This is how a normal economy functions in any part of the world," the country's new finance minister, Alfonso Prat-Gay, told reporters Wednesday. The previous president , Cristina Fernandez de Kirchner, had placed controls on the peso for four years to curb inflation. Despite that, inflation has climbed higher and just this year rose about 25%. A mostly fixed exchanged rate caused the peso to become deeply overvalued. Until Thursday, the peso was worth about 9.8 pesos to the dollar. Once the controls were lifted Thursday, the peso tanked 26% to 14.5 pesos to the dollar. The move has risks. It can case the peso to lose too much value and spark even more inflation. However, the currency manipulation discouraged foreigners from investing in Argentina. And the country badly needs foreign cash. Last month, American Airlines announced it wouldn't accept pesos, partially due to how overvalued the peso was. Macri's party appointed Federico Sturzenegger, a U.S. trained economist, to lead the central bank. Sturzenegger needs to encourage foreign investors to come back. Quickly. Argentina's central bank has seen its foreign reserves plummet in recent years due to debt payments and inflation. Reserves peaked over $50 billion in 2011, but have since fallen to $24 billion, according to the central bank. Macri cut personal income taxes and lifted taxes on exports to help stimulate trade and spending. Kirchner had implemented the export tax and outraged farmers in Argentina. The country's economy is powered by commodities like oil and soy. Exports are crucial to its economic growth. Farmers, mostly grain suppliers, have now agreed sell the grain reserves that they've piled while waiting for the currency to devalue. Macri and a group of international banks have already agreed on a $5 billion loan which will shore up reserves while the government rebuilds investor confidence. Prat-Gay, the finance minister, said he expects cash flows into Argentina will be anywhere between $15 billion to $25 billion over the next month, which will help boost the central bank's reserves. Hardly anyone believed Kirchner's numbers on Argentina's economy. The IMF demanded earlier this year that Kirchner's regime publish more legitimate data. So Macri brought in a new team of econ nerds to bring credibility back to Argentina's statistics agency, INDEC. Legitimate data should also lure investors back to Argentina. Macri is expected to bring a lot more reforms. If challenged, he has to make sure the reforms stand a chance in court. Macri issued a decree to appoint two new supreme court justices to vacant seats. Those appointments should help his agenda. Argentina needs cash and the biggest road block is a group of hedge funds in New York who own defaulted Argentine debt. Kirchner refused to pay them and Argentina has been shut out from accessing foreign financing until it pays the bill. Macri's team says it will negotiate with the creditors, led by billionaire Paul Singer. But any agreement has to be passed through Congress, where his party is the minority. Major challenges lie ahead for Macri and Argentina, but experts agree he's taking the right steps so far. "It's still early days, but Mr. Macri has made a good start to his term in office," says Neil Shearing, chief emerging market economist at Capital Economics, a research firm.